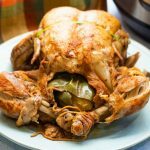 This Instant Pot Cajun Whole Chicken comes out of the instant pot flavorful, juicy and delicious. The meat literally falls off the bones! Dry chicken with paper towels. Sprinkle chicken with garlic and pepper to your liking, over the entire chicken. Add olive oil to the in the inner pot. Turn the instant pot on saute mode when the oil heats place your whole chicken inside without the trivet. Sear chicken on both sides 3-4 minutes. Remove chicken and turn instant pot off. Scrape off any tidbits. Next, place chicken on a clean platter and rub as much cajun seasoning as you like on both sides and inside the cavity. Stuff the chicken with the onions and bell peppers. Tie the legs with the twine and place silicone band over wings. Inject marinade into both sides of the breast, legs, and thighs of the chicken. Pour chicken broth into the inner pot with the trivet. Set the chicken on top of the trivet. Close the lid. Turn the knob to the sealing position. Press the manual button and set for 35 minutes. When timer goes off do a quick release by turning the knob to venting. After the valve goes down carefully open the lid and remove the whole chicken using heat resistant gloves. Place chicken on a serving platter. Cut and discard the kitchen twine and silicone band from the chicken. * You can set the instant pot for 30 minutes, and do a quick release to check the internal temperature to make sure it reached at least 165 degrees. We preferred the internal temperature at 170 for our 4.53 pound chicken. * Cook the chicken at least 6 minutes per pound.